I, admittedly, don't tweet a lot on my personal life. 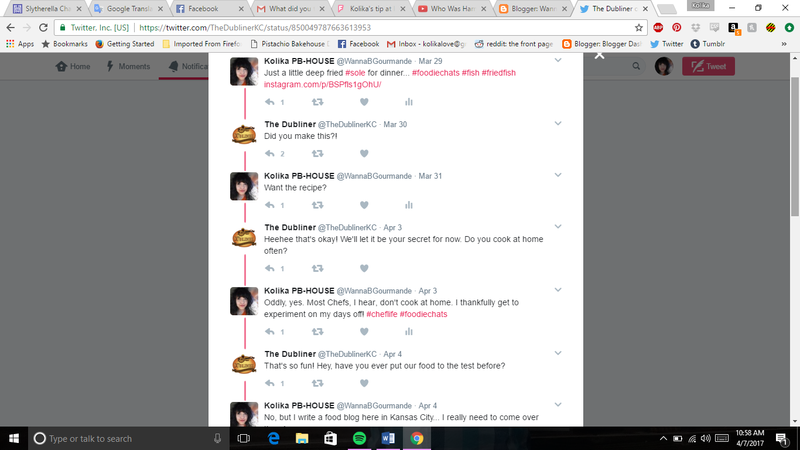 I spend a good portion of my Instagram time promoting my business and my life as a chef, and my twitter is basically reserved for Foodiechat Mondays. I'm frankly having a rough time balancing personal and business time, considering I'm burning the candle at both ends. This is why I cherish the time I get to spend alone with B., and be out and about having fun. I tweeted at The Dubliner, telling them to gird their loins, at about 5:45 pm on a Thursday night. When we entered, the place was completely empty, save for an adorable blonde server that took care of us promptly. We sat up in a booth, away from where the crowds would likely be, so we could enjoy our meal and conversation. Eating out is sometimes difficult, as B has a pretty severe intolerance to dairy, We tend to stick to most Asian places when we eat out, as it's almost a guarantee that dairy isn't on the menu anywhere except for crab rangoon. That being said, we found something to eat. 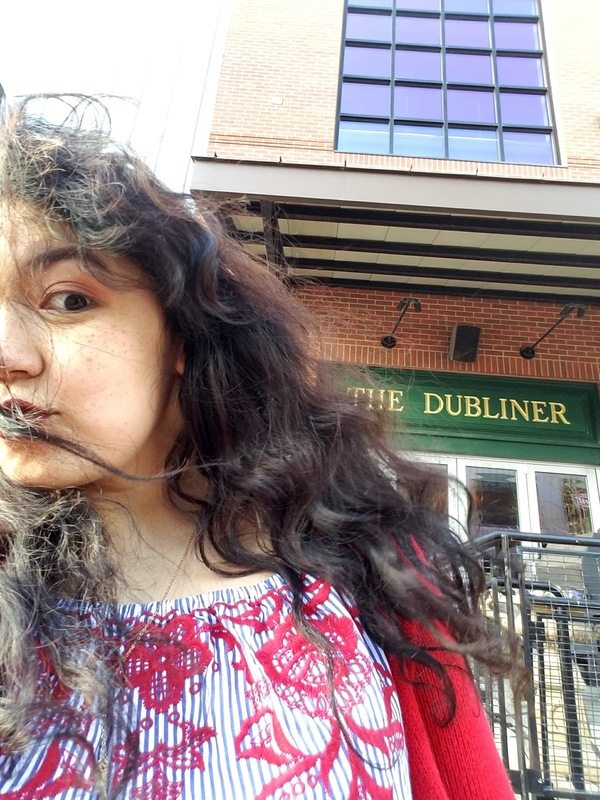 Between the time it took for us to place our order and get our food, the Dubliner filled up to the rafters, and our poor server was running around like a madwoman - not surprising, considering she was the only one on the floor. We later found out(after a 30 minute wait for our food) that the manager had sent the other two servers home, thinking that they wouldn't be busy on the Thursday before First Friday. Unfortunately, all of the Downtown office scene had decided to stop in for a post-work drink and some food. Oh well. Such is life. Remember: in the UK, their chips are our fries, while our chips are their crisps. 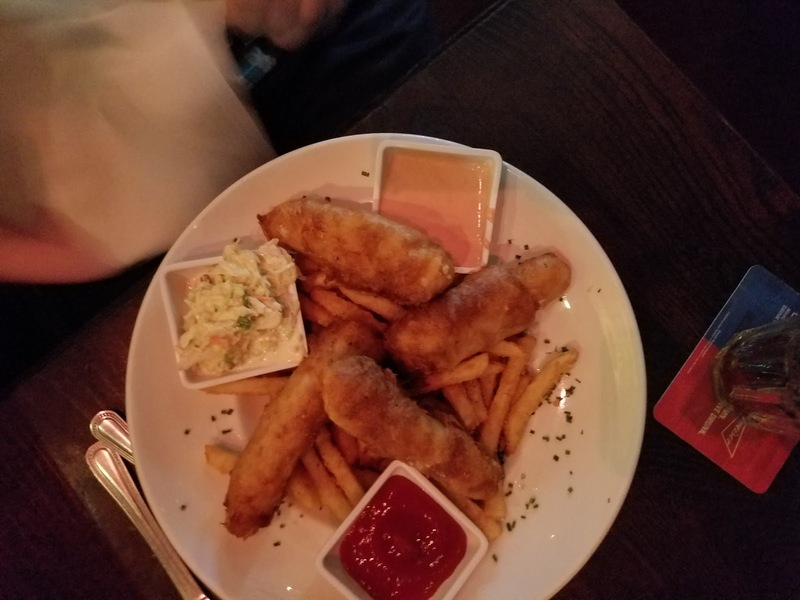 B ordered the Fish & Chips, and got it with malt vinegar, only because I told him to try it. The fish was moist, the chips were good, and the portions were nice. All and all, it was a really solid fish and chips. I liked how it was served on a nice plate, yet still seemed 'homey' and 'bar food'y. Yes, there's a great bit of virtue in those gastropubs that I'm such a huge fan of, but it was certainly refreshing to just have a real honest-to-goodness regular pub meal. Chicken & Rashers was my meal of choice, and boy howdy was it good. 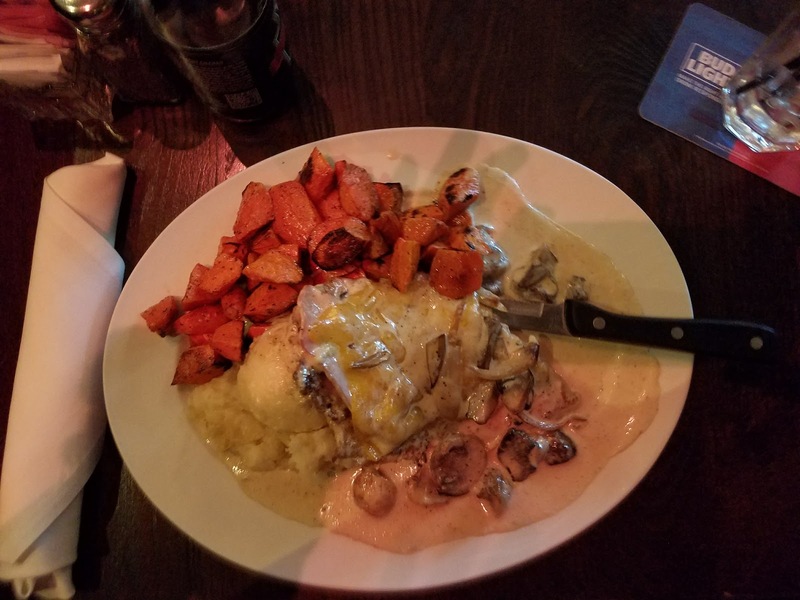 It was a hair underseasoned, and the cream sauce was barely reduced and tragically runny, but the roasted carrots and potato puree was very good, and the meat itself was nice. Oh, and in case you didn't know, a 'rasher' is just Irish bacon! Super good, house-cured, and decently executed. I have to say that, again, it was nice to skip the 'gastro' and just eat the 'pub.' The portions were great, filling, and pretty good. I imagine that if I were drinking, this would be an excellent drunk food for me. The dessert was a yummy apple cake with vanilla ice cream on top, which was super sweet, and very stick-to-your-ribs. 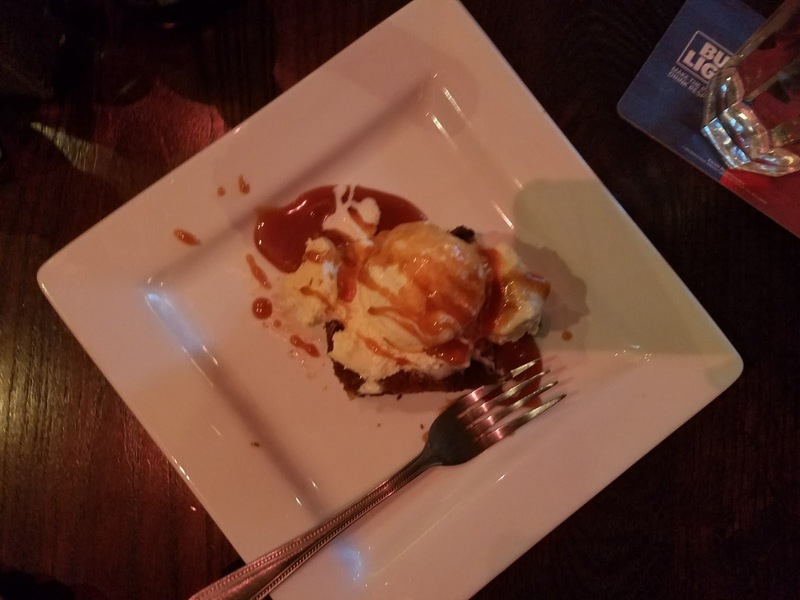 I know that the butterscotch sauce was made in-house because it was really grainy; this happens if you stir the sugar at the wrong time during cooking, and is an easy mistake to make, especially since one often doesn't go into a pub for something sweet. It's 100% understandable that they wouldn't have a dedicated pastry chef, and put this on the pantry cook's shoulders, so I'll absolutely give them a pass on this. All in all? A pretty solid meal. I'm not a big drinker, but I can see the appeal of being at a nice, solid Irish but after work. I saw a ton of young professionals from offices nearby in downtown, meeting for an after-hours drink. The Dubliner has its demographic down, and make no apologies about it. Honestly, it's sort of nice to see something un-ironic nowadays. I won't say the Dubliner is great, but it's good. It is a solid, good pub, that makes no apologies about what it is. Will I be by again? Possibly, since I don't drink often. If I am bumming around downtown, however, I'll absolutely stop in for a sandwich or some sort of lunch.